We believe that spiritual life is a key component to all students’ educational experience. A biblical worldview is central to our way of life at LBC. It’s the foundation for our academics, and it drives how we live, how we work, and how we engage each other. 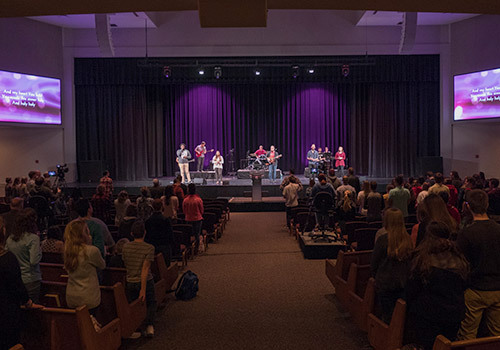 In practice, LBC provides several opportunities for students to know and serve God on campus and in the community – weekly chapels and Christian service. Weekly chapel services are the one place and time where the entire LBC community can gather to encourage one another and receive instruction and challenge from the Word of God. These services are at the core of Lancaster Bible College’s effort to encourage spiritual growth in the life of every student. 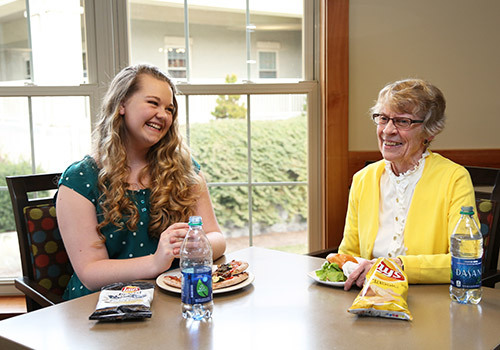 Chapel services are required for all students – both residents and commuters. Chapel is held Tuesday, Wednesday and Thursday from 9:10-10 a.m. in the Good Shepherd Chapel. The name “Good Shepherd” comes from the large stained glass window hanging in the foyer that shows a full-length figure of Jesus holding a lamb and a shepherd’s staff. The stained glass was given to the college by a Methodist church in Lancaster. The foyer is also decorated with the flags of countries where alumni are serving, and they also represent the home countries of our international students. The Good Shepherd Chapel, built in 2000-01, is the first dedicated worship facility on the Lancaster Bible College campus. The large brick structure is located at the center of our campus and seats 1,600. All student chapel services, concerts, conferences, convocation, commencement, and other special services are held here. Serving is an integral part of the learning process and the journey of the Lancaster Bible College student. Service is required each semester for every student at the college in a few different capacities. A student receives a pass (P) or fail (F) based on their performance as evaluated the Director of Student Success or their internship/practicum advisor. First Year Experience (FYE): The first year student (0-29 credits) learns the LBC culture, develops understanding of their unique giftedness, solidifies a church to attend, and serves through Mission 3:30 service projects. Christian Service: The sophomore student (30-59 credits) serves in the local church, parachurch, or community organization with the purpose of being gospel and mission driven. Internship: The junior student(60-89 credits) completes in-depth training related to the student’s professional course of study. Practicum: The senior student (90+ credits) completes in-depth training worth 3 college credits in the area of the student’s professional major. The student is required to report their involvement for First Year Experience and Christian Service through a reporting structure and links found on the FYE and CSV eCampus course sites. Students involved in Internship and Practicum are required to complete assignments and reporting through their advisor. A student who receives two failing grades for the service requirements of their curriculum at any point in their academic program is subject to dismissal from the college. This student will be interviewed by the Director of Student Success or their internship/practicum advisor who will make recommendation to the Provost and the President of the College.